Organization is a fundamental part of running and growing a small business. It is a continuous process that goes hand in hand with productivity. If you want your business to operate smoothly and successfully, you need to not only get organized but also stay organized. With commitment, time, a system, and the right tools, you can effectively manage and organize your small business. Cover all business areas and put your organizing skills to work! Here are some practical tips to help you get started. Getting your business organized starts with goal setting. Define and write down your plans and what you want to accomplish for your business. Use an organizer or planner to remind you of your scheduled meetings, orders, and important events. You can also create a vision board that represents your goals. Stick to your plan and make necessary adjustments to ensure that you’re on the right track. With concrete plans and clear goals, it will be easier for you to organize your business. Studies have shown that keeping a to-do list is a success habit of wealthy people. This is a good habit that you can adopt to drive business success. By writing a to-do list the night before, you’ll be able to identify your daily tasks and prioritize. This not only solidifies the overall goals and plans you’ve set, but also helps you get more organized and be more productive. Business organization also means managing and organizing your office or workspace. Clutter and dirt add to stress and burnout and hinder productivity, so make sure you keep your space clean and organized. Pile papers in a tray, manage computer cables, and keep the basics. It’s also a great idea to place a plant and motivational decors/items on your desk or office corner and wall. If you run your business in an office setting, with several employees, encourage everyone on your team to do their part in making the whole office a great place to work in. Paper is a big cause of clutter and disorganization. Managing paperwork can also be very time-consuming. In fact, according to survey, workers spend around 6 hours of their time each week searching for paper documents. To make your small business more organized, try to reduce your use of paper and go digital! Use cloud storage and an online document management system that suits your business. 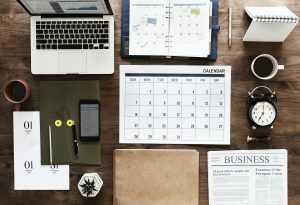 Aside from digitizing your paper documents, there are now productivity tools that you can also use to organize and streamline your workflow and marketing strategies. You can optimize tools for content creation, social media management, email management, customer support, and others. A skillful and reliable virtual assistant can help you with these tasks. Together, you can get your business organized. A lot of small business owners attribute their business’ profitability to organization. Take note of the tips above and you, too, can grow your profits by having an organized business.